L's Monster First Birthday Party Mama Say What?! | Mama Say What?! Cassie’s little man recently celebrated his first birthday. How time flies! 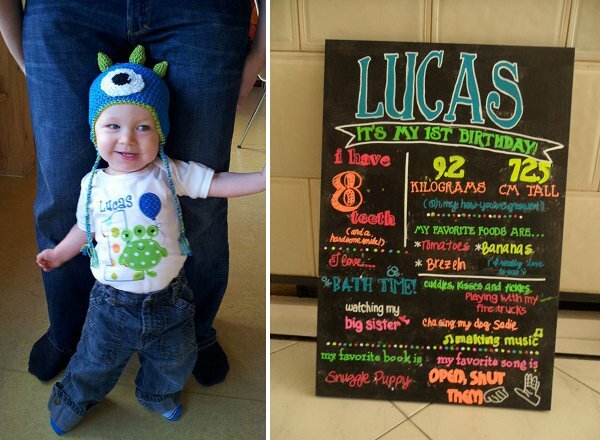 She did an amazing job creating a super cute and DIY-friendly monster themed party in blue and green for her little monster. Her creativity and crafty flair are truly an inspiration for mamas looking to throw a handmade and fun birthday party for their little guy with lots of personal touches – and this theme could easily be used for a girly party too! Check it out! I threw a monster-themed party for my son’s first birthday. We invited lots of his friends over. Everything was blue and green! We had tons of balloons, a couple games and lots of cake. 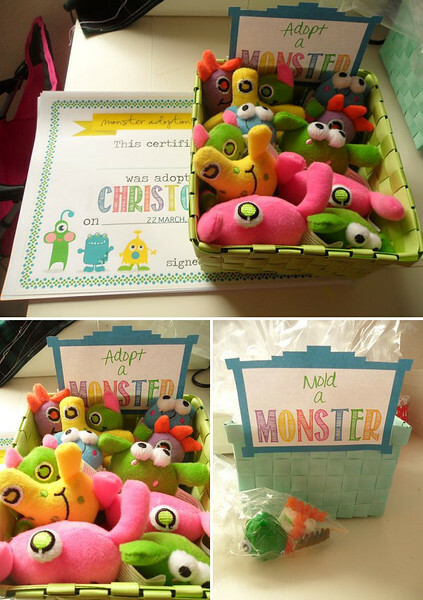 For favors, we set up an Adopt-A-Monster basket with adoption certificates and a Mold-A-Monster basket with little bags of playdough complete with eyes and other accessories. 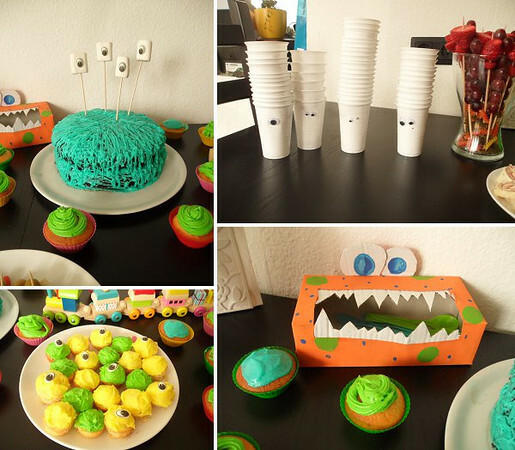 I had seen monster-themed parties on Pinterest and I loved the idea. My little guy doesn’t have any specific interests that I could turn into a party theme just yet, so I went with something most kids like: funny, silly monsters! 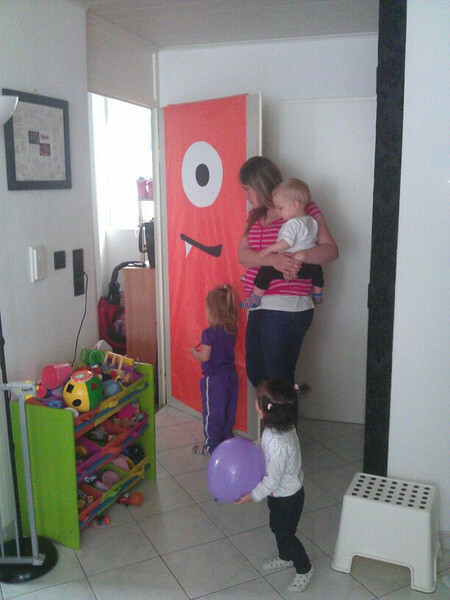 I really like how monster décor is easy to DIY, making the theme cost-effective as well. I really love the way our door monster turned out. It was so simple to make— wrapping paper and some poster board! I really liked the Pin the Eye on the Monster game that the older kids played. 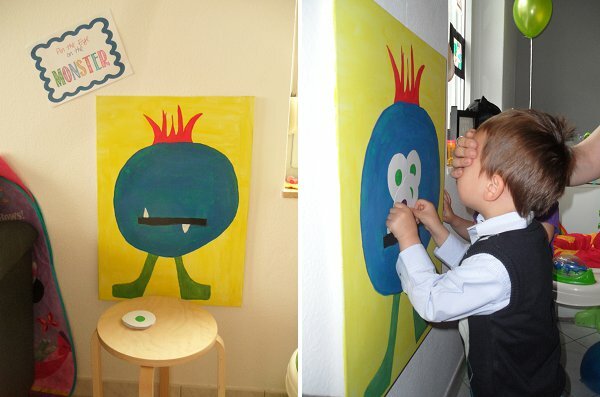 I painted an eye-less monster on a large canvas and cut out some eyes from poster board for the kids to tape on. The kids liked it! What was the birthday boy’s favorite moment of the celebration? I think L really loved just having all his friends over to our house. He was a little overwhelmed when everyone started arriving, but after some quiet snuggling and a quick nap, he felt much better. He really enjoyed sitting and playing with all his friends! If you worked with vendors, what did you love about them? I ordered Lucas’ party shirt from WeeWoolieKnitz on Etsy. It is so cute and matched his theme perfectly! 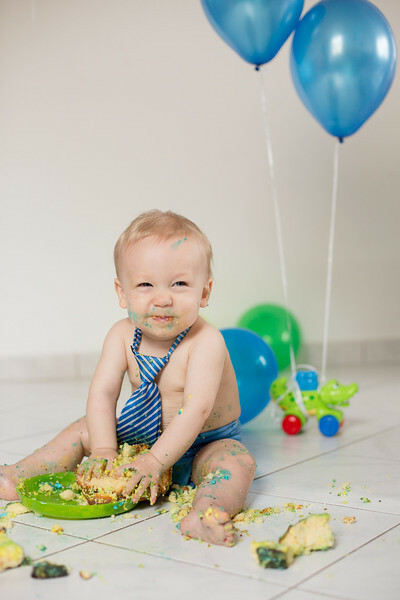 We also had a photographer, Kay Rogge, come to our home the day after the party to shoot Lucas’ cake smash. It was great and L had so much fun — he even actually ate most of the cake! Everything else in the party was DIY, and we held the party at our own house. Is there anything you wish you would have done differently? If so, what? I only wish I would have started preparing for the party a little earlier than I did. It was a particularly busy few weeks so I kept putting things off until the last minute. So the night before his party, I was up later than I should have been baking and DIYing some things! Focus on your baby and having fun! Certainly take pictures and certainly show off all your hard work, but don’t forget to really enjoy the day and watch your little one have a blast! Added by MaryEllen M. on May 15, 2014. The “adopt-a-monster” idea is genius!! Such a smart way to give a goodie bag that the kids (and parents) will want to keep! So cute! Im glad I seen this, I’ve been trying to figure out cute DIY ideas for my little monsters bday!